I took the press-preview bus to the newly renovated Noguchi Museum in Queens (32-37 Vernon Boulevard, Long Island City), and this is my report. If you haven’t read last week’s little essay, please scroll down and read it now, because it sets up the themes that will now prevail: restoration, memory and presentation. Note too that the photo above took me hours to choose. Is it too glamorous? Not glamorous enough? Should I have used a close-up of one of the sculptures indoors? A cluster of lamps? Should I have tried even harder to make Robert Wilson’s installation on the second floor look decent? In terms of these art trips, you are trapped with other art writers, faux-press, collectors, educators, and always perky information officers. Nevertheless, since I remembered how difficult it is to get to the Noguchi Museum on one’s own steam, I sacrificed my anonymity. What’s a stick-on name tag among friends? At least they spelled my name right, and I wouldn’t have to spring for a cab. I try not to drive in New York, particularly during times of high-volume traffic, and my slight knee-injury from my photo-accident in Philadelphia (I slipped on ice while photographing industrial ruins, if you remember) precluded the ten block walk from the subway stop nearest to the Noguchi — ten long Queens blocks, not manageable Manhattan blocks. After being closed for two and a half years for sorely needed renovations, the Noguchi Museum was reopening. The brick, 1928 photo-engraving plant with the artist’s 1982 cement-block addition is so close to the bank of the East River that the basement was always full of river water. Uck. Built on landfill over water, the walls were settling and cracking. Everything is now shored up, as it were, and there’s even heat and air-conditioning for the fully enclosed galleries, so for the first time the museum can be open all year round. The museum is restored to the way Isamu Noguchi (1904-1988) made it, wanted it, left it behind. The first floor with its partially open-air, cement block “rooms” and a cozy garden feature his mostly clunky, I think, late sculptures. Nevertheless, there’s joy in seeing his mind at work in their deployment in space. Noguchi worked as Brancusi’s studio assistant in 1927, but here, aside from one glorious marble hoop (called The Sun at Noon, 1969) not much of Brancusi’s sublime reductiveness seems to have stuck. Noguchi is an interesting case study. Born to an American mother and a Japanese father, he was rejected by his professor dad when he and his mother moved to Japan. Later, back in the U.S.A., when his mother dumped him at the age of fourteen at the Interlaken School in La Porte, Indiana, he was known as Sam Gilmour, using his mother’s surname. In early adulthood, he studied “academic sculpture” at the Leonardo de Vinci School of Art on Avenue A in New York. 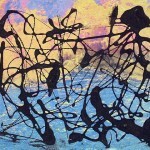 His teacher, one Onorio Ruotolo, afterwards claimed he had taught Noguchi by psychic means. Another teacher, Gutzon Borglum of Mount Rushmore fame, thought he had no talent at all. On his way to Japan, Noguchi, who now had taken his father’s name, crossed the Soviet Union in search of Vladimir Tatlin’s Monument to the Third International, unaware that it had never been built. Mistakes, mistakes. During the Second World War, he made the mistake of allowing himself to be convinced that he could do good work as a Japanese-American by voluntarily admitting himself to an internment camp in Arizona. And I always thought McBride, an early support of modernism, was one of the good guys! But am I in the minority? I revere Noguchi’s design work. And, when I see more this fall when “Noguchi and Graham” opens at the museum, I will probably vote a great big Yes for his “sets,” props, and costumes for dance-matriarch Martha Graham, although we curse the day she read Carl Jung and apparently simultaneously discovered that dancers could move centered on their solar plexus – somewhere around the belly-button — and thereby writhe expressionistically on the floor, as if every emotion was like giving birth, difficult birth. On the basis of the Noguchi Museum garden and his plantings at Lever House – – cleverly the departure point for our tour bus – I suspect Noguchi was a fairly good landscape designer. His public sculpture, like the late stone carvings, remains iffy. remember ages ago how delighted I was when I worked nearby (at the ancient Brentano’s Bookstore, as foreign magazine subscriptions manager and noontime rare book clerk) and discovered that the art I admired was actually by Noguchi. Is it still there? I’ll have to check next week. I never liked his 1968 Red Cube balanced on one point in front of the Marine Midland Bank Building but admired his Zen-influenced Sunken Garden for Chase Manhattan Plaza, 1961-64, also all the way downtown. I wonder if after 9/11 both are still there. So I must make a note to myself to take a look next time I go to Century 21 for discount designer clothes or to J&R for camera or computer stuff. On the debit side, is dreadful 1984 Bolt of Lightning…Memorial to Ben Franklin that greets you as you drive across the Benjamin Franklin Bridge into Philadelphia. In a city with the worst public art in the universe – next to Chicago — this travesty wins the prize for sculpture as unintentional parody of “modern” art. To this day I can hardly believe that Noguchi, who designed such splendid tables and paper lamps could have had a hand in this wacky, ugly homage to Franklin’s kite experiment. But back to the present. The first bit of good news is that although Noguchi did not envision such, in November there will be a room at the Noguchi Museum devoted solely to his design masterpieces. The other good news is that there will be at least one temporary exhibit annually on Noguchi qua other artists or on art that influenced him or was influenced by him, thus expanding the museum’s mission and making repeat visits a necessity. Sadly, the announced exhibits, with the exception of “The Imagery of Chess Revisited” (a recreation of the famous 1944 chess show at the Julien Levy Gallery, are not exactly breathtaking. To include the banal Andy Goldsworthy in “Noguchi: Sources and Influences,” coming in October 2006, has to be a typo. I would urge a Scott Burton survey. I would urge an exhibition of lamps by other designers and sculptors. I would even like to see a show of Robert Wilson’s opera sets and furniture. The bad news, alas, is that the first temporary exhibit “Isamu Noguchi: Sculptural Design,” out of the Vitra Design Museum in Germany, is muddled. I say see it at all costs – because of the great Noguchi furniture and lamps — but be aware that, contrary to what you might have heard, the just afore-mentioned theater “genius” Robert Wilson might not be at his peak when designing exhibitions: this effort is stygian and chaotic. It is so dark, take a flashlight with you. 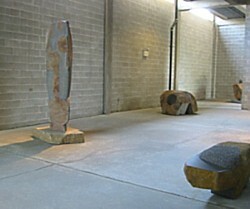 Noguchi works, good and bad, are picked out with pin-spots in a series of disorienting caves. Because I was offended by the very idea that major museums would fall for an Giorgio Armani retrospective, I did not see Mr. Wilson’s efforts either at the Guggenheim in New York or at the Walter Gropius-designed National Museum when I was in Berlin. Surely there are clothing designers who are artists on the level of painters and sculptors – Rei Kawakubo immediately comes to mind – but Armani for all his good taste is not one of them. To put it simply, he had the funding in hand. Here at the Noguchi: stop the Musak; let in the light. Wilson’s opera designs may be great, but what works at a distance does not necessarily work up close. The Noguchi Museum’s new gift shop looks better and better honors Noguchi’s famous sofa than does Wilson’s murky tableau, using a fake window and wood-chips. And that winding path over large-gauge gravel, makes Noguchi’s little bits of sculpture seem like counters in a game of Parcheesi or Snakes and Ladders. The inaugural survey exhibition aside, single-artist museums like the Noguchi, designed by the artists themselves, may be the ideal way to see a body or work – or not, depending on the artist. By all reports, Donald Judd’s museum in Marfa seems to be transcendent, which is an ironic term for the work of a minimalist whose thoughts on art approach Logical Positivism. I salute the sensitive, almost willfully nonglamorous restoration/renovation of the Noguchi Museum and would hope for more artist-focused (and artist-financed) self-memorials but I have to mention that just because you are a great artist doesn’t mean you are a great curator of your own work. How many artists really know what work is their best? It is like choosing your favorite child. And do all artists know how best to display their wares? Noguchi obviously knew how to present his sculptures in their best light. As in a really good photograph of ultimately dull work, they probably look better in Queens than they could look anywhere else. But isn’t how they photograph and how they are remembered what they are? There’s a full-scale Noguchi sculpture retrospective coming to the Whitney next October so perhaps I will be better able to appraise his work. I know I like the photographs and my memories of notched, marble slab, bio-morphic pieces from the ’40s, YvesTanguy be damned. But all the rest?